🍀 Our goal? 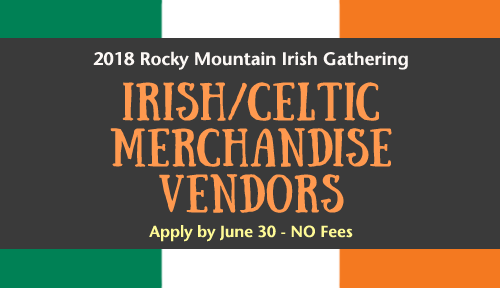 To be sure everyone involved in the 2018 Rocky Mountain Irish Gathering has a successful experience while our festival guests get to enjoy and purchase the very best offerings from our merchandise vendors. 🍀 Your costs? NO VENDOR FEES! Only the cost for electrical service should you need it. 🍀 We ask that over the festival weekend you donate $50 to the Rocky Mountain Irish Wolfhound Assoc. You can drop it off at their tent anytime through the weekend — make your check payable to RMIWA. You can learn more about the organization on our website at the RMIWA tab. They are also the dedicated beneficiary for this year’s festival. Thank you for your support! 🍀 Your size limitations? NONE regardless of what size area you need to sell your products we have the space for you! 🍀 Booth locations? Right in the heart of the music, food and Guinness ( as well as other great beer offerings) so the foot traffic is right in your space! Click on one of the following links to download the 2018 Rocky Mountain Irish Gathering Vendor application: Word doc or PDF. There as they say is always a “CATCH” — our catch is we ask you to promote the festival to the best of your ability with your contacts, Facebook page and your website calendar.